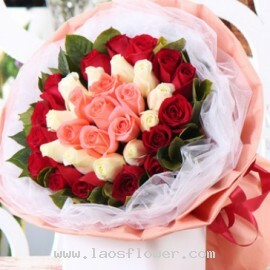 33 roses mean you love her the most and want to love her forever. 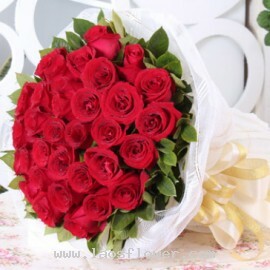 33 roses mean you love her the most and want to love her forever. In Chinese, No. 33 is the magic number. Means 3 lives and 3 generations, or generation to generation, or forever --- bouquet of 33 roses to send to loved ones is the most popular in China. The size is just big and beautiful. 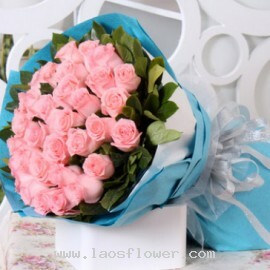 A bouquet of 33 pink roses. Wrapped in white paper and outside wrapped in blue paper. Adorned with a white bow. The roses and material can change to other colors. Occasionally, substitutions may be necessary to create your bouquet due to the availability of certain flowers in various parts of the..
A bouquet of 33 red roses decorated with leaves wrapped with white mesh and tied with a white and gold ribbon. 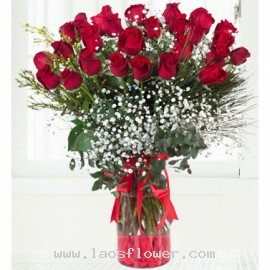 This bouquet is perfect for a birthday gift especially when age 33 year old, which matches the number of roses in the bouquet. It is also an auspicious number for Chinese people. 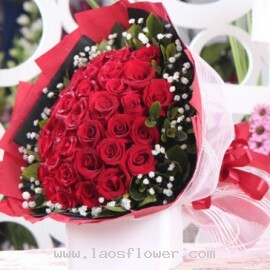 The color ..
A bouquet of 33 red roses accent with white gypsophila flowers and leaves around the outside. Wrapped in black & red papers and wrapped with white mesh outer. Adorned with a red bow tie. The color of roses and wrapping materials can be changed. Occasionally, substitutions may be necessary to ..
A bouquet of 33 white roses arrange in round shape accent with purple statice flowers and white gypsophila. Decorated with a small purple bow on the roses. Wrapped with purple and white paper and tied with a purple bow. Occasionally, substitutions may be necessary to create your bouquet due to th..
33 red roses arranged in a glass vase accents with white gypsophila flowers and eucalyptus leaves and tied with red ribbon. The color of roses and ribbon can be changed. Occasionally, substitutions may be necessary to create your bouquet due to the availability of certain flowers in various parts..